The ETS-Lindgren Model 5247 is a self-contained portable enclosure for making wireless device over the- air performance measurements. The unit can be used for design verification, pre-certification, and production line measurement applications. 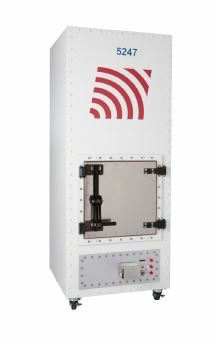 The ETS-Lindgren Model 5247 is constructed with the same RF shielding and shielded door technology used in the construction of our larger, full certification wireless test chambers. The RF shielded door uses compressible finger stock in a “knife edge” configuration. Two latch points with a single point handle provide secure sealing and one-hand operation. Typical RF isolation of both the shielding and door is greater than 80 dB. The RF anechoic absorber used in the Model 5247 is performance optimized for the frequencies of interest. The absorber limits reflections and moding, contributing to more accurate, repeatable measurements. Tapered wedges line the walls, pyramidal absorber is used on the floor, and lossy foam lines the antenna. The ETS-Lindgren Model 5247 is equipped with an EMCO brand, dual polarized horn antenna. The standard included antenna can make both linear and circular measurements over the frequency range of 700 MHz to 6 GHz. (Optional hybrid required for circular measurements.) Typical frequency response is flat from 2 GHz through 6 GHz.